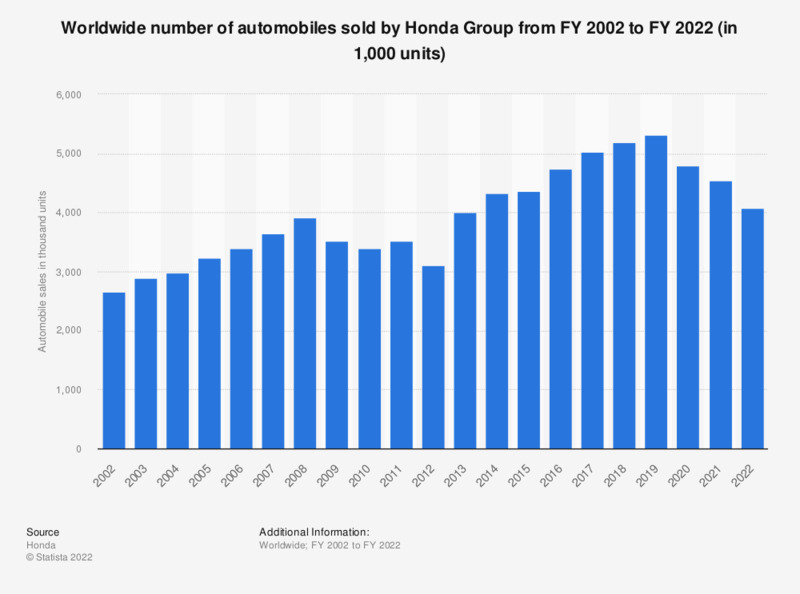 This statistic portrays Honda's automobile sales from the fiscal year of 2002 to the fiscal year of 2018. Globally, Japan's Honda Group sold about 5.2 million automobiles in its 2018 fiscal year. Additionally, the group sold nearly 20 million motorcycles and 6.2 million power products that year. Honda, one of the largest conglomerates in the world, produced around 121.6 billion U.S. dollars in revenue in 2016. Much of its revenue was generated from automobile sales, as Honda’s worldwide car sales reached a peak for the decade between 2005 and 2015: Honda sold over 5.2 million automobiles in the 2018 fiscal year, representing a significant increase compared with 2012, when the company sold only a little over three million automobiles worldwide. Honda Jazz sales figures are among the hottest in the market. More than five million units have been sold globally since 2001. This model, which is also called Honda Fit in some markets, was among the highest ranked models in the 2015 Vehicle Dependability Study, conducted by J.D. Powers. In order to meet demand for new cars, Honda's light vehicle production is forecast to increase from around 4.7 million units in 2015 to about 5.9 million units by 2022. The growth in automobile sales during these last few years also had a positive impact on Honda’s global net sales. At 15.4 trillion Japanese yen, the company reported its best financial year on record in 2018. The result was mainly fuelled by strong sales in North America, one of Honda’s most important automobile markets. In 2016, Honda produced two out of the five top selling cars in the United States: Honda Accord and Honda Civic. In 2017 alone, Honda sold more than 377,000 Honda Civic vehicles and over 322,600 Honda Accord vehicles to customers in the United States. As of March 2018, the company captured a market share of around 8.8 percent in the U.S. Furthermore, it accounted for 9.5 percent of the Canadian automobile market in March 2018. Honda's fiscal year ends March 31. The figures refer to Honda Group's 12-month results. The figures for 2002 through 2016 are taken from previous editions. Everything On "Car brands: Honda" in One Document: Edited and Divided into Handy Chapters. Including Detailed References. Finland: How would you describe the car(s) you own/lease?